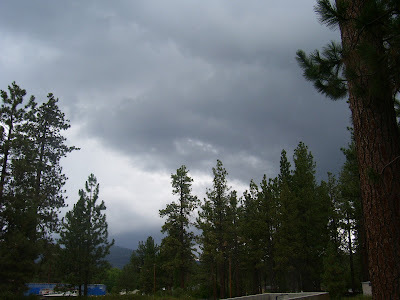 Gold Rush Resort Rentals Blog: Monsoon Season hits Big Bear Valley! Well folks, it's that time of year again when our beautiful Big Bear Valley can expect to see afternoon/evening/nighttime thunder storms, lightening strikes, deluges of rain, maybe some occasional hail, wind and flooding! Living here in the San Bernardino mountains we can experience all kinds of weather that is so much different from that which folks experience living in off the mountain locations like the upper and lower California deserts, the LA basin, Orange County and the San Diego area! Even though we are only a couple hours away from most of these locations, we live in an very different climate zone! We mountain locals love the fact that these rain storms will settle the dust and wash away the yellow pine pollen that covers everything in the late spring and early summer. It also will cool the air to a tolerable temperature and relieve the hot stickiness that comes with the high humidity!! With the Monsoons comes the threat of fires from lightning strikes. Over the course of one "Monsoon event" there can be over 300 + ground strikes from the lightning! We are very fortunate here in Big Bear that most "locals" are aware of this and will report smoke sightings and even the smell of smoke in the air to our local fire departments, which will vigilantly check out any and all calls of this nature either by aircraft surveillance or physically going to a location where smoke has been seen. However, on the up side, Mother Nature's "light show" at night with the lightening flashing is a real spectacle to behold! Sit out on your front porch and let the show begin! Sometimes some of our furry family members are afraid of the noise the thunder makes, but the fact that these rain storms are over relatively quickly is comforting to us knowing that our "kids" will not be stressed out for very long.